The Wi-Fi wireless remote control has a built-in lithium-ion rechargeable battery which can last up to 5 hours of continuous use when paired with your Muvi K-Series. The 7 buttons allows you to control most of the camera’s settings and features, such as video recording, still photos, photo burst and settings ensuring you never miss a moment. 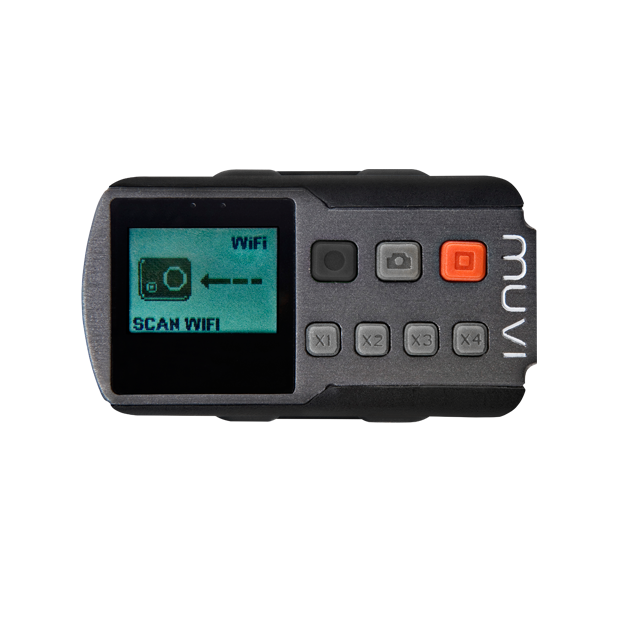 The Wi-Fi remote has a built-in LCD screen, which when paired with your Muvi K-Series will mirror the status screen directly on the remote control, for confirmation of the cameras functions and settings. The rugged and robust design of the Wi-Fi remote has an IP66 rating, which means that the remote is protected from total dust ingress and from high pressure water jets from any direction. Perfect for any action sports such as cycling, skiing/snowboarding, mountain climbing and other outdoor activities.